Why Aren’t More People Talking About L.A. Pizza? When it comes to pizza, the multiplicity of styles *is* L.A.’s style. 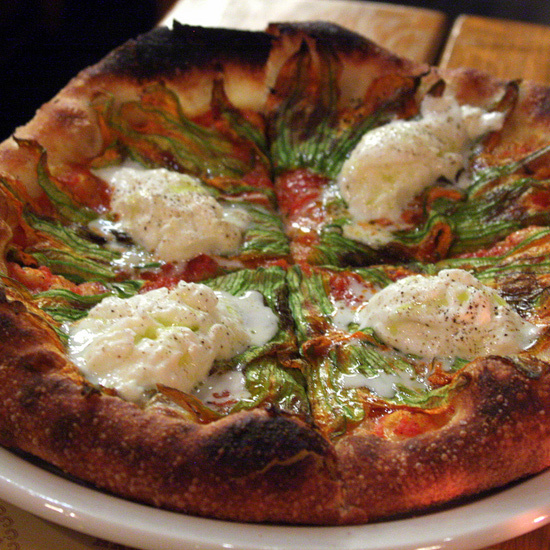 We’ll admit it, Los Angeles has never been known for its pizza. Despite the proliferation of chef-driven pizza restaurants in the past decade or so—thank you, Nancy Silverton—the humble pie still exists in the shadow of tacos, that other affordable casual food. The burgeoning growth of pizza spots in just the past year, however, represents something of a moment in this city. And we need to talk about it. Just as New York-style pizzas are famously Neapolitan-inspired, with their thin, foldable crusts, someday Los Angeles might have a trademark style of its own. Until that day comes, the multiplicity of styles is L.A.’s style. Roy Choi’s POT Pizza Joint channels Detroit in its square party cut, while the pies’ thinner crust is characteristic South Chicago style, Choi told Food & Wine in an interview last year. “But the pizza is really an L.A. slice,” he says. “It's all of the influences, but I wanted it to drip and stank of L.A.” he says. That is: Bright and bold flavors, anything-goes toppings. The Ktown special, an ode to the neighborhood in which the restaurant is located, sports kimchi and fresh salad with soy and rice vinegar to cut the grease of the cheese. It is unabashedly a product of Choi, and of Los Angeles. One must also mention Travis Lett’s Gjelina, Daniele Uditi’s Pizzana, Jon Shook and Vinny Dotolo’s Jon & Vinny’s, and Zach Pollock’s Cosa Buona in EchoPark (the lovable Pizza Buona whose location it took over now survives in a new spot, nary a block away). This is to say nothing of the longer standing neighborhood spots which have been serving the city for decades—Casa Bianca Pizza Pie in Eagle Rock is among the most beloved (and faithful to nostalgic fantasies of checkered tablecloths and leather booths). Let’s not also forget Wolfgang Puck, who pioneered so many of the concepts of fine dining at his flagship Spago—including then-radical goat cheese as a pizza topping. Despite this diversity in pizza styles, Chicago deep dish has always been a minority in this city. Perhaps the multi-pound behemoths are too heavy for L.A.’s eternal summer? Because a few soggy, doughy ambassadors have ruined the perception of a whole subset? Who knows. But aside from Masa in Echo Park, Dough Box in El Sereno, Hollywood Pies in Mid-City, and a couple others, there really is a scant showing given the size and breadth of L.A.’s culinary scene. As of last November, however, a fine dining alum joined the fray. Luis Ulloa, who early on in his career staged at Jean-Georges Vongerichten’s Market in Paris, and later worked at San Francisco’s two Michelin-starred Aqua, now shuttered, opened Blackbird Pizza Shop on Melrose Avenue. 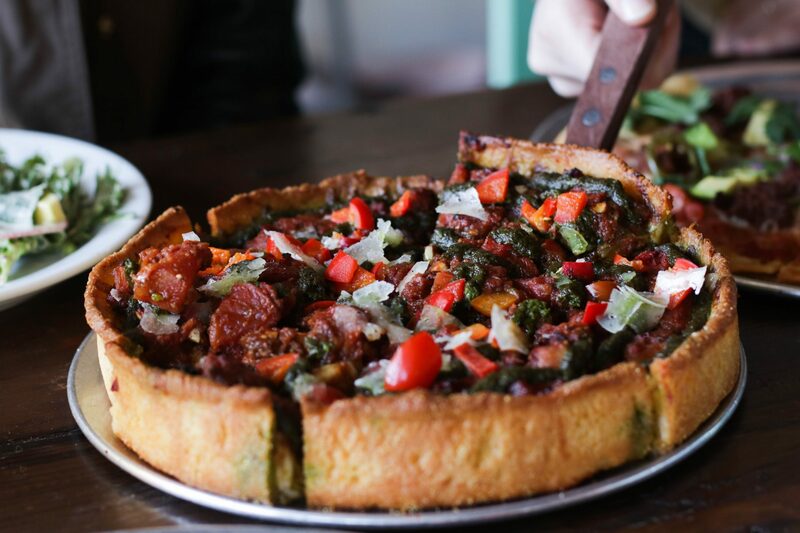 It meets all the expectations of what a good Chicago style deep dish should be: Visually arresting, almost casserole-like in its density and generousness of filling. It manages to avoid the bread bowl-like trap, however, with a supremely sturdy cornmeal crust. Eaten piping hot out of the oven, it is a thing of beauty: The crisp 20% cornmeal dough punctuates the ooh and goo of cheese and tomato perfectly, tasting slightly sweet of cornbread. The crust can get a little hard after it cools, but it seems that’s a necessary textural tradeoff. Does this mark a rise in Chicago style spots in Los Angeles? Maybe, probably not. Will it inspire more neighborhood pizza spots, simultaneously chef-driven yet casual, straddling that line that L.A. walks so well? Hopefully. It does definitely cement one thing: L.A. as a bastion of pizza excellence, which more people should really be talking about.